Who knew the Amazon had so much random junk in it? 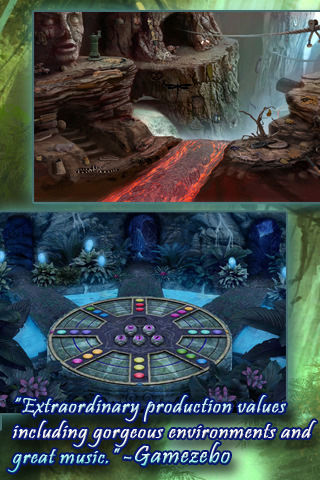 Amazon: Hidden Expedition is a gorgeous hidden object game released by Big Fish Studios that has you prowling the Amazon rainforests in search of things like hamburgers and roller skates. Presumably they all assist you in some way, although I’m not entirely sure how, but the game is still a top-notch example of the genre. Many people think of hidden object games being like I Spy or Where’s Waldo, but Amazon plays more like Nick Chase, lots of hidden object finding, but intercut with challenging mini games as well. It’s not quite as narrative-driven as Nick Chase, but there’s definitely a little story involved. You are called in to help locate Professor Mandible, who was hot on the trail of discovering the whereabouts of the mysterious Beetle Temple. Like Indiana Jones, you are plunged into a number of exotic locales where you must track down pages from the Professor’s notebook (along with a number of other things) and get a hint as to his location. The artwork for the game is outstanding for the genre, very rich and detailed. The objects are definitely on the random side, but they look integrated into the scene, even if they don’t make much sense. The scenes can be a bit dark, but you can easily zoom in and drag around for a closer look. Most of game is fairly straightforward seeking and finding, but there are also a number of sparkly hotspots that require you to use a particular object before they will reveal their secrets. These are usually nicely relevant to the scene and add to the game’s overall sense of discovery. To help you along the way is a very generous hint system. At any time, you can click on the name of the object you are looking for and see the silhouette to assist you, but there is also a limited number of explicit hints for when you’re well and truly stuck. You can recharge hints by locating the 5 hidden beetles in every scene, and I spent a lot of time looking for the beetles just for fun. You can also revisit levels to look for lost beetles if you like, or try to find all the objects faster for a better score. The OpenFeint achievements for the game really reward the thorough player, and there are a ton of awards for things like finding all the beetles or finishing a level within a certain amount of time. It adds a wonderful layer of replayability to an already robust game. It also comes with nice features like iPod music support and even runs natively on the iPhone and iPad, all of which make Amazon: Hidden Expedition is a remarkably appealing title. Hidden object games aren’t for everybody, but if you were a fan of Nick Chase or just like extremely polished casual games, definitely give this one a try. AppSafari review of Amazon: Hidden Expedition was written by Tracy Yonemoto on June 7th, 2010 and categorized under Adventure, App Store, Featured, Fun, Games, Puzzler. Page viewed 4854 times, 2 so far today. Need help on using these apps? Please read the Help Page.